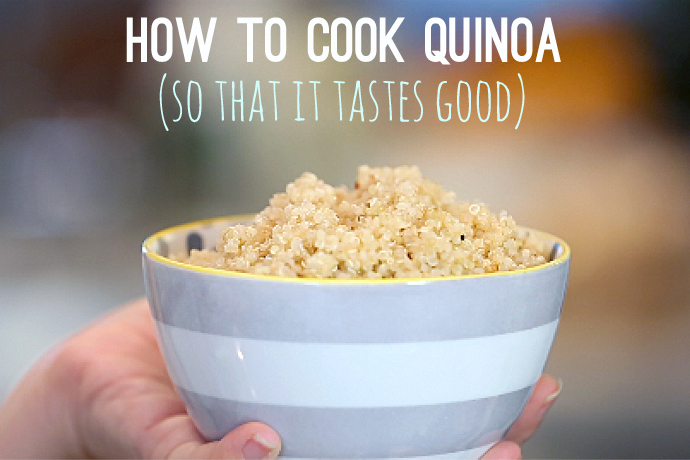 How to cook quinoa so that it always tastes great. How to cook quinoa so that it’s fluffy, mild, and delicious — even kid friendly. I know what you’re thinking: quinoa is so 2013. Or maybe it’s just, ewwwe, quinoa. Either way, I encourage you to reconsider this healthy grain (which is actually a seed, but who’s keeping track?). It’s very high in protein and, if you cook it correctly, has a mild flavor. Yes, mild. That weird smoky, bitter taste comes from cooking quinoa incorrectly. Here’s how to cook quinoa the right way so that you can use it as an easy, nutritious substitute for rice, grains, or maybe even pasta if you’re adventurous. Related: How to cook pasta perfectly, even ahead of time. Though you may have heard that you’re supposed to rinse most types of rice before cooking, you probably skip that step without a problem. Not with quinoa. The outside of the seed has a bitter coating that needs to be removed if you want it to taste, well, not bitter. Place your quinoa in a fine mesh strainer and run it under the water using your fingers to massage it. 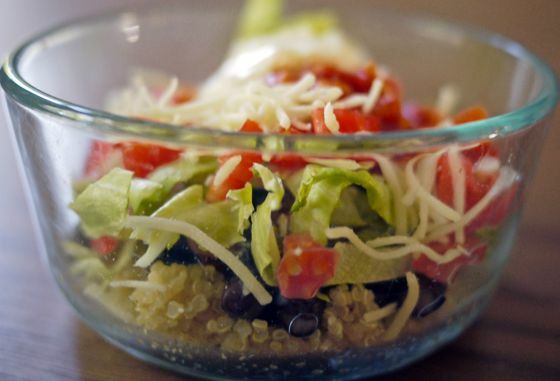 The friction created by rubbing the quinoa helps shed the outer layer. Once you’ve rinsed it, dump the damp quinoa into a pot and turn the heart to medium. Do not add water: You want to dry toast the quinoa. Keep it over the heat, tossing every 30 seconds or so with a silicone spatula or wooden spoon so that it doesn’t burn, until it’s totally dry and begins to pop like popcorn. If you’d like to add a dry spice to your qunioa like garlic powder, cumin, or curry powder, add it at the beginning of this step. Once dry, it’s time to add your cooking liquid of choice to the quinoa. Be careful: It will steam, spit, and sizzle as it hits the hot pot. You want to add 2 cups of water, chicken or vegetable broth for every cup of dry quinoa. Broth and even a splash of white wine go a long way to make quinoa tasty. So does salt; if you’d like to add some, now’s the time. Use a ¼ teaspoon for every cup of dry quinoa. Related: How to make corn stock, plus delicious ways to use it. Bring the quinoa to a boil uncovered. Reduce heat to a simmer—it’s important that the quinoa is not left at a rolling boil for the duration of the cooking time—and cover. This is very important: Leave the pot covered, as in no peeking for at least 15 minutes or steam vital to keeping your quinoa fluffy will escape. One cup of dry quinoa cooks in 15-20 minutes; check quickly at 15 minutes and, if all of the liquid has absorbed, it’s ready. Otherwise, cover the pot as quickly as possible and leave for another few minutes before checking again. When the quinoa is done, turn off the heat and leave the pot covered to rest for at least 5 minutes. Then, uncover, fluff the quinoa with a fork, and serve. 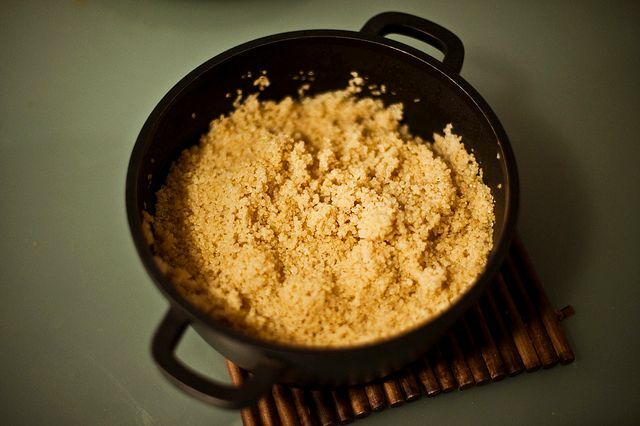 I think you’ll be surprised at what a difference it makes to cook quinoa using this method. If I’m right and you become a convert, consider making double batches each time. Serve some for dinner and freeze some to have on hand for a quick, last-minute meal; freezing quinoa works beautifully. And if the kids get into quinoa, too, you can even pack them a quinoa lunch bowl for school lunch. It’s easy super easy to personalize. If you’d like to watch the steps for how to cook quinoa, hop onto my site, One Hungry Mama, where I’ve posted a short video. You can see exactly how the process goes, from washing the quinoa well to hearing how it pops when you toast it. Or just follow the steps here—it’s super easy to do.